PJ here. I've said it before but it bears mentioning again; overcoming one's natural shyness and speaking to fellow elevator riders can bring the nicest people into our lives. I'm so happy for the spontaneous conversation in an elevator at the 2013 RWA national conference that introduced me to Tracy Solheim. 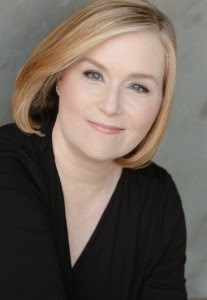 She's a delightful woman who just happens to write terrific contemporary romances. Please give her a warm welcome as she returns to TRD to tell us about her new novella for Tule Publishing, Holiday at Magnolia Bay. I have a confession to make and a tiny apology. My latest release, Holiday at Magnolia Bay, may be a little misleading to readers expecting the novella to be laden with Christmas references. In fact, most of the story takes place well before the holiday season—but you’ll find a very satisfying ending that takes place at Christmas time! Since it’s not “technically” the Christmas season yet, I hope you’ll forgive me. I had a good reason. You see, my story’s heroine, Jenna Huntley, is a marine biologist with a passion for sea turtles. She meets Drew Lanham, a battle weary Navy SEAL, while trying to protect a nest of loggerhead sea turtle eggs. Those big sea creatures only nest during the summer, so you can see my dilemma, right? The novella—and the relationship between Jenna and Drew—had to start at the end of summer when the turtles hatch. Of course, there’s still plenty of Christmas cheer during Drew and Jenna’s happily ever after moment, you’ll see. So why did I write the book this way? Because I’ve always been fascinated with sea turtles and I couldn’t imagine a book taking place in coastal Carolina without mentioning them. Like Jenna, growing up my family gravitated to one beach on the North Carolina coast for years—and I’ve continued the tradition with my own children. We’ve been fortunate enough to see these great turtles in “the wild” and also stranded on the beach. Turtle nests along the shore are as much a part of our vacation spot as sunburn and seagulls. I’ve been lucky to be able to watch under a late summer moon as a nest of loggerhead turtles bubbled up from the sand and sprinted into the ocean. It was awesome! Island, Georgia. The day-long backstage tour was the basis for my description of the fictional Magnolia Bay Turtle Center. If I made any errors, it’s totally my fault for not taking proper notes. (In my defense, other books were drowning this one out in my head at the time!) The tour was fascinating. We watched the giant beauties swimming in large salt water pools. My son even got to feed some. They allowed us into the incubation room, the operating room and a smaller “triage” suite where one of the biologists was fixing the flipper of a young loggerhead. It was a trip I’ll never forget. If you’d like to learn more about the Georgia Sea Turtle Center, here’s the link: http://www.jekyllisland.com/jekyll-island-foundation/conservation-programs/georgia-sea-turtle-center/ It’s worth the visit. I brought back a keepsake from that trip that hangs on my Christmas tree every year—see, I got us back to Christmas! It’s one of my very favorite ornaments. And, in the spirit of the holidays, I’m giving a sea turtle ornament away to one lucky person who comments on this post along with a Tule gift bag. Tell me about one of your favorite holiday decorations or mementos. Does it have a story behind it? It can be any holiday throughout the year, too! I have several favorite holiday keepsakes. Many are handcrafted ornaments made by little ones in my life over the years. I have a handblown egg ornament made by my youngest brother when he was eight years old (he's now 42) that has a place of honor on my tree every year. Thanks for hosting me, PJ! I love the handmade masterpieces, too. My kids always cringe when I pull out the ornaments made from popsicle sticks and googlie eyes, but it wouldn't be Christmas without them. I have one which I treasure. A hand blown glass murano ornament which my late father brought back from Italy years ago. thanks for your post and giveaway. Murano glass is exquisite but I'm sure the sentimental value of your ornament far outweighs the craftsmanship. 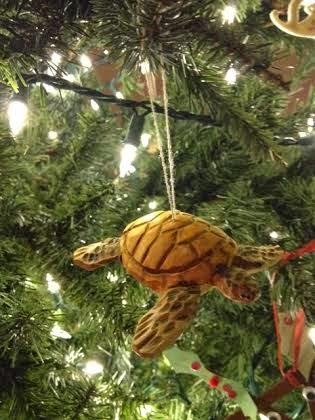 Your sea turtle ornament is lovely and one of my favorites. We celebrate Chanukah and a Menorah that is very meaningful to me is my mother's menorah which we use every year for 8 days. This is something which I cherish greatly since she is no longer with us and I miss her presence badly. I am glad that I have this important gift which is precious. I have no doubt that your mother is with you in spirit each time you celebrate. I have a collection of Hallmark "Pony for Christmas" ornaments which I add to each year. I have all the yearly ornaments, plus most of the re-issues. Last year, I finally had enough to decorate a 4 foot tree in ponies! With a little help from other horsey ornaments, of course. Have to gush about the turtles ... I was lucky enough to see a Loggerhead turtle nest excavation, where they check the nest a few days after the big hatching. There was one little turtle left behind in the nest and seeing that baby was one of the highlights to our visit to Hatteras Island last year! I've added Holiday at Magnolia Bay to my Wish List. Hee hee. A new Pony for Christmas ornament is released each year by Hallmark. Each one has a rocking horse or other horse toy and a teddy bear. This year's "pony" is a buckskin rocking horse with a cowboy bear and cuter than it should be! I was lucky enough to see three full size Green Sea Turtles on the beach in Hawaii last year. It was incredible. Oh, I've been collecting ornaments for over 45 yrs. so really hard to pick one. I can still even remember the few precious one that unfortunately got broken - breaks my heart. I will pick the 2 glass bells that were on my family tree. My oldest sister got married first and was given all the ornament and since she hasn't bothered with a tree for 40 years I thought I'd get them but she gave them to her daughter so did manage to get two of them and I hope to give them to my two daughters! Congratulations on your newest release! I love Christmas books and I love Southern books, so I rushed off to download Holiday in Magnolia Bay as soon as I read the post. Our tree is covered each year in ornaments with a history, and most of my angel collection has a story that makes it precious. One that is especially dear is a three-foot high angel that stands beside our tree. She was intended to be a Christmas gift for my mother from a dear friend who is part of our family-by-love. My mother died six days before Christmas in 1997. The friend sent the angel explaining that she had planned it to brighten Mother's Christmas and requested that it instead be a reminder that Mother was celebrating her first Christmas with the angels but our memories would ensure that she would always be part of the family celebration too. She is. Even the youngest of her great-grands knows the story of Nana's angel. Oh, Janga, that's beautiful! I'm tearing up here. :) What a wonderful way to have your mother always remain a part of Christmas for your family. Oh, Janga. What a beautiful memory and tradition. I'm mopping up the tears over here. Your mother's spirit lives on with each generation of your family through your memories and the stories that surround Nana's angel. I have a blown glass Santa ornament that is special. I also purchase an ornament every year for my sister's tree, such as an ornament that is a tribute to the special bond of sisters. I love the idea of a sharing Christmas ornaments. When our kids were younger, my cousin and I would do that for the kids so they'd have their own set of ornaments when the got older. I still try to find a small one with their name on it each year. Looks like another wonderful book, Tracy! My favorite Christmas decorations, other than the ones made by my children which they have forbidden from being used on the tree, are ones that my mother bought from the New York Metropolitan Museum. For years they had a series of snowflake ornaments based on old art. Every year Mom would buy each of us an ornament. She did it for a few years after the kids were born as well so they have a few. We will definitely be checking out the Georgia Sea Turtle Center. It is just the type of place we like to visit on trips. It is good to know that more is being to to help these wonderful creatures survive and hopefully increase their numbers. The odds are definitely against the little turtles when they hatch. It takes special, dedicated people to work on projects like this. Your characters sound interesting and it will be interesting to see how they work things out. I guess my favorite holiday decoration is our first nativity set. I went to Guam to visit my husband where he was on temporary duty during the Vietnam war. We had been married 5 weeks when he was sent back over (we had to change the date of our wedding because they extended him on his first tour there). The night I was to fly back to stay with his mom where he was to come for Christmas, all B-52 crews were recalled to the base and restricted to the base. I still left but another wife took me to the airport. The next morning was the start of the bombing of Hanoi which eventually lead to the end of the war. Needless to say, he was extended again and didn't get home until mid-january. We went shopping while I was there and I fell in love with a Hummel nativity set. They had the realistic traditional style, but the one I liked had figures that reminded me of the children in the Disney It's A Small World ride. It is sweet, innocent , and just darling. It was the first holiday decoration we bought and is still treasured today, 42 years later. It started a love of nativity sets and I seem to add another one every year or so. 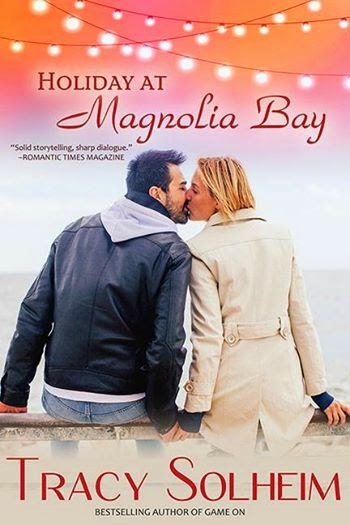 "Holiday at Magnolia Bay" sounds wonderful. My favorites would have to be those made by my children many years ago. Very precious.